MTA talmidim in Rabbi Danto’s Freshman Shiur have voluntarily taken it upon themselves to not only be mesayem the entire Maseches Megilla, but to also do chazzarah on each daf at least 4 times. As part of this unique initiative, the entire Shiur was invited to participate in a very special event, held on Thursday, April 11th and sponsored by V’haarev Na, an organization that encourages experiencing the sweetness of Torah through constant chazzarah. Seven current Sophomore talmidim, who were in Rabbi Danto’s Shiur and participated in the event last year, joined in this year’s celebration as well, where they made a siyum on the completion of another round of intense chazzarah on Maseches Taanis. The program included a learning seder with more than 800 talmidim and divrei Torah from Rabbi Yissocher Frand, followed by dancing and singing in celebration of their great accomplishments in Torah learning so far this year. The evening concluded with a festive seudah and lively kumzitz. 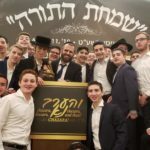 Rabbi Danto’s talmidim were uplifted and inspired by this incredible event, which renewed their excitement for limmud Torah and intense chazzarah.